It’s getting closer … and now just 11 days until Opening Night for the Cardinals at Wrigley Field against the Cubs. After yesterday’s marathon post, a quick one today. And who else comes to mind except Jose Oquendo when you think No. 11? Other than from 1996-1998, “The Secret Weapon” has worn the number since 1986 — as a Cardinals player through 1995 and as a coach since 1999. His nickname was from Whitey Herzog, who first played Oquendo at every position except catcher during the 1987 season. Yes, he pitched — during a game the Cardinals were losing 12-4 when he entered the game in the eighth. Looking at the box score on Baseball Reference, looks like Whitey was having a little fun that inning. When it comes to pitching, though, the Secret Weapon is unfortunately no Aaron Miles. Oquendo gave up three runs that inning on four hits with a walk and a hit batter. The next season, the Secret Weapon pitched once again — along with playing every other position too, including catcher. He joins a very exclusive club with that achievement, and was the first National League player in 70 years to accomplish that feat. Read more from Mark Tomasik at RetroSimba. He pitched on May 14, 1988, taking the mound in the 16th inning of a 5-5 tie game against the Braves — a game he’d entered in the ninth inning at first base. And this game went on … and on. Take a look at the box score from Baseball Reference, if only for the sheer entertainment of seeing the positions played by Tom Brunansky and Jose DeLeon (yes, the pitcher, though he did not do so that day) and especially for their switching back and forth in the play-by-play section. For three innings, Oquendo held the Braves scoreless. He even started out the 19th inning, his fourth on the mound, with a strikeout! Things went a little downhill after that, though — he walked a few, threw a wild pitch and gave up a 2-run double to Ken Griffey Sr. and unfortunately ended up the losing pitcher. 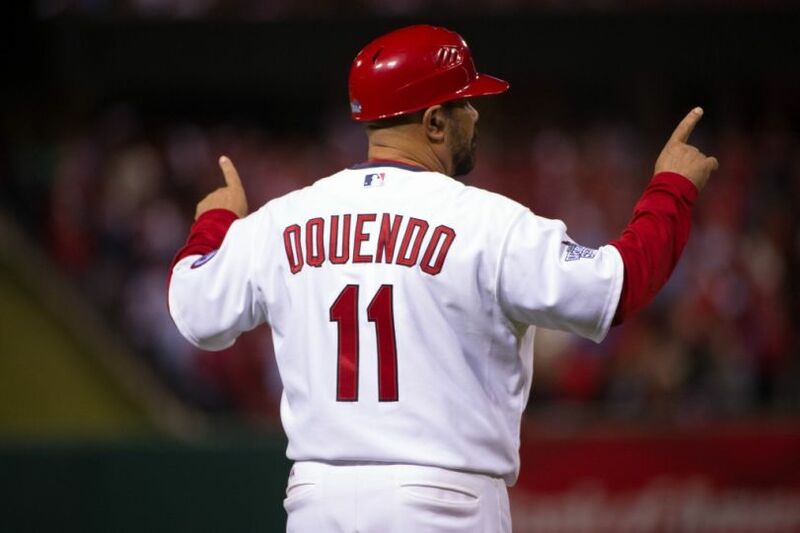 This entry was posted in 2015 Cardinals and tagged Countdown to Opening Day, Jose Oquendo by Christine Coleman. Bookmark the permalink. We even used the same picture and same video this time! I saw that! Such an awesome video, though, so it makes sense!